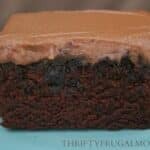 This deliciously moist chocolate cake mixes up in just 5 minutes and will have you kissing store bought cake mixes goodbye! It’s egg free too. You all, I never thought I’d say this, but I’m grateful for the Avian Bird Flu epidemic. Remember back about a year ago when egg prices were sky high because of the egg shortage that the Avian Bird Flu caused? Well, it was thanks to it that I discovered this Best Ever Chocolate Cake recipe. Over that time I was trying to avoid using eggs more than absolutely necessary in an attempt to help out our minimal grocery budget. I mean, when eggs cost $2 or more a dozen you start thinking twice before you use them! At least you do if you are like me and are used to paying less than $1 a dozen for your eggs. Anyway, one day I was in the mood for a baked dessert. But of course, baked desserts typically take eggs. And as silly as it might sound, I was kind of agonizing over the thought of using 3 to 4 of my precious eggs to make a simple dessert for us. So, I started flipping through my cookbooks looking for inspiration and perusing all the baked dessert recipes to see if I could find one that sounded good but that also didn’t take more than an egg or two. I was looking through a small family cookbook that I have when I happened across this amazing chocolate cake recipe. I couldn’t believe it- it took absolutely no eggs! And it claimed to be the best chocolate cake ever too! I was intrigued. And of course, I had to give it a try! And you all, I was totally sold on the first bite! It was absolutely perfect. Deliciously moist, nice and chocolaty, not too dense. Just everything that a chocolate cake should be. And it’s been the only chocolate cake recipe that I’ve used ever since. I also love how super easy this Best Ever Chocolate Cake is to make. It’s seriously pretty much as easy as a boxed cake mix…you just dump everything in one bowl, mix it up by hand or with your mixer and bam, you are done! But unlike a boxed cake mix, it’s made with real ingredients that you can pronounce and know what they truly are. BEST CHOCOLATE CAKE- no eggs, no butter! 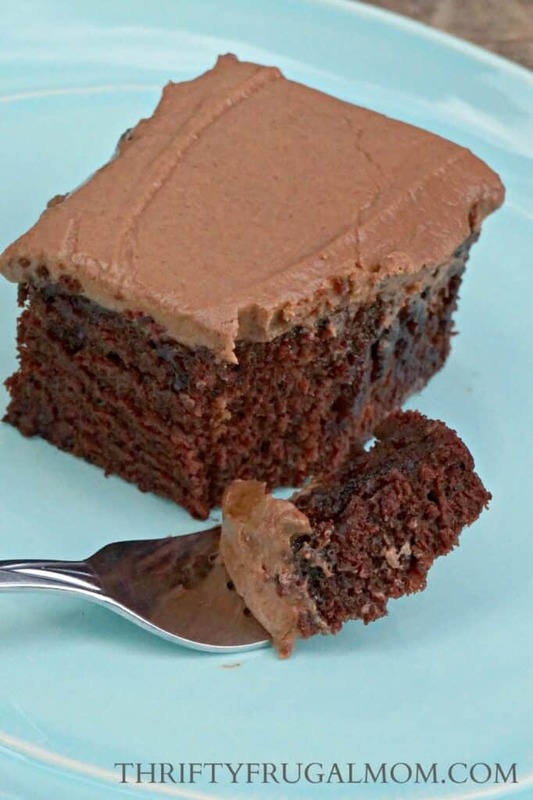 This deliciously moist chocolate cake mixes up in just 5 minutes and will have you kissing store bought cake mixes goodbye! Mix all ingredients and pour into a greased 9 x 13 pan. Bake at 350 degrees for 30 to 35 min. If you want to make a layer cake, you can also bake this in two round cake pans or two 8x8 cake pans. You will need to reduce the baking time to 20-25 minutes though. 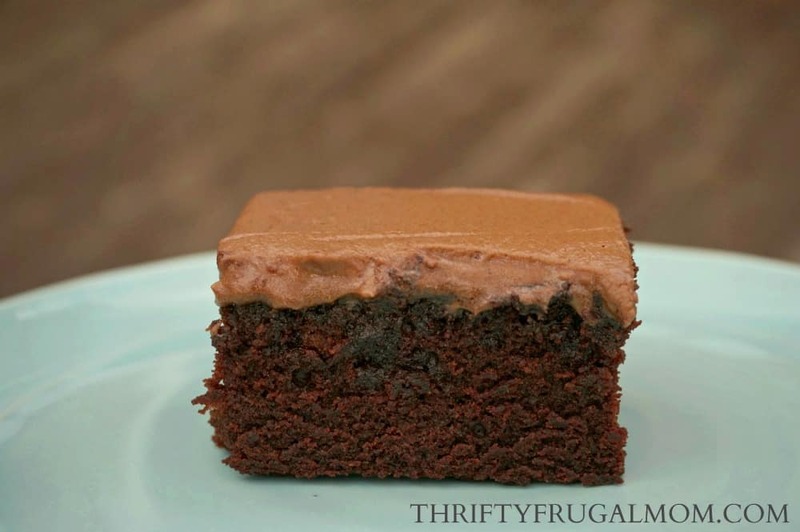 This looks so yummy, and so much more frugal than my normal chocolate cake recipe. My go-to has almost a pound of butter, and several eggs as well. We go to a potluck every week after church, so a cheaper dessert recipe is exactly what I need! I'm going to make it tomorrow. Yes, it's super frugal! And I have nothing against butter :), but I admit, this cake is way better than my previous recipe that called for butter. Hope the cake turned out well for you! 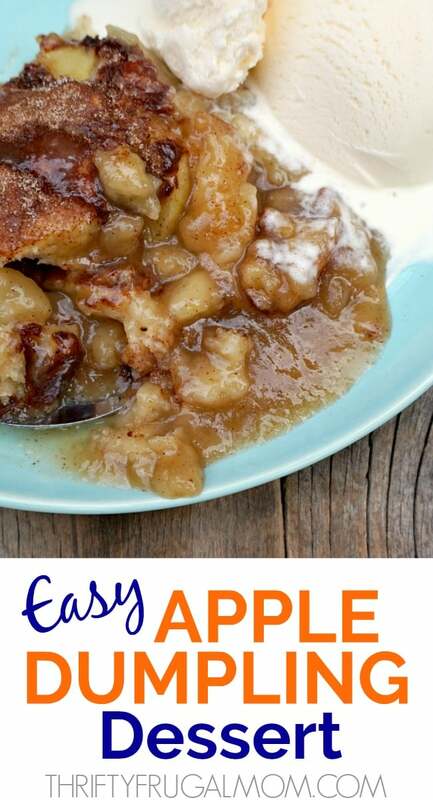 Love this recipe and I can't wait to try it. Which icing did you use? 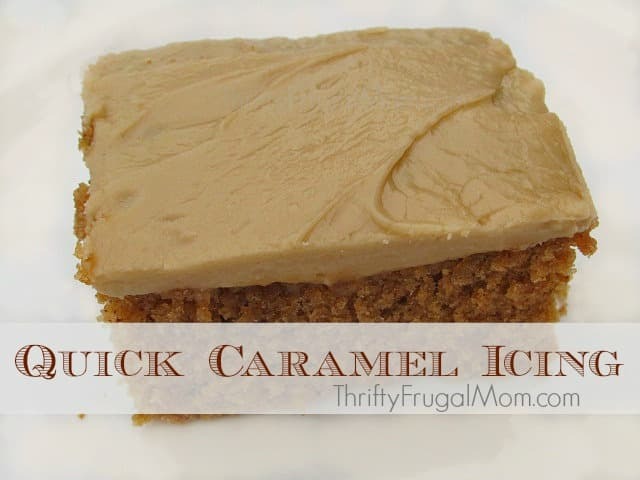 Paula, I usually make this and top it with my Quick Caramel Icing. But the cake in the pictures has a homemade Chocolate Buttercream icing. I would love to get the recipe posted to the blog some day....just not enough hours to get everything posted that I would like too! :) If you want the recipe though, I'd be happy to email it to you. Best chocolate cake ever ! I found exactly same recipe somewhere on internet some years ago - except yours is doubled of all ingredients. This is the only cake I bake and freeze to have a piece with my coffee from time to time. People, try this, I fully recommend it. I did a search for a chocolate cake that used no eggs.... and your recipe popped up. At the same time I was looking for a way to use up leftover coffee. I had milk in my coffee that had turned a little sour, so.... I followed your recipe, using two cups of creamed (with milk) cold coffee instead of plain water. Talk about wonderful !! 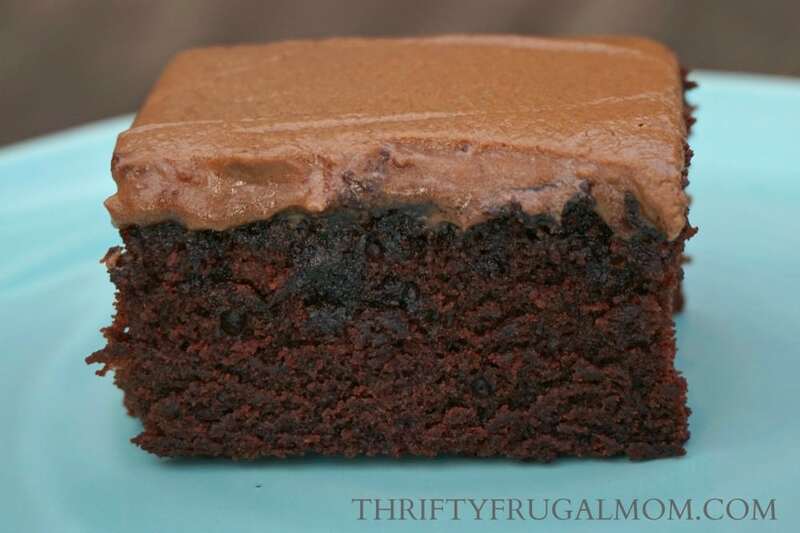 This cake is moist, very flavorful and ~easy~...and much better than a boxed cake mix !! Thank you for posting your recipe !! Beverly, I absolutely love the way you got creative and used up your leftover coffee in this cake! I've subbed water for coffee in chocolate cakes before and it always adds a nice depth of flavor. And I'm sure that little bit of cream only made it better! :) So glad you loved it. Thanks for taking the time to let me know! Lydia, I have luckily discovered your website today. As I was reading, I realized something seemed familiar....now that I read about you I know what it is! I was born and partially raised in Lancaster, PA. This cake is in the oven as we speak, and I realize that it is my grandmother's exact recipe! That makes it extra special, because there are not many of my family members left, and finding your recipes has turned out to be very comforting for me. Thank you. I made the cake this weekend with the icing recipe on this page and we loved it! My daughter's BF has a major dairy /whey allergy and he can eat this cake and she is subbing almond milk for the icing and almond flour for the cake. He never gets to eat any type of dessert due to his allergies. She is pretty excited about treating him. My cake was made per the recipe and it was great! Had a little left over icing so I'm gonna have to figure out how to cut that part some but overall it is a great recipe and we truly enjoyed it! Best part is I always have all the ingredients in the pantry so it definitely a win win! Aw, thanks for your very kind words, Katie! And so glad you enjoyed the cake. It's one of those recipes that is so shockingly simple that it seems like it couldn't be that great. But it's always a hit no matter who I serve it to!